It's not easy to find your favorite artist at mp3.com. But those who have time and passion, will discover music, which is worth to be showcased. One of these artists is C M. Don't ask me who C M is. It's the personal decision of every artist to publish his name or not. "With roots as a classically trained trumpet and French horn player, C M’s musical vocabulary has evolved over the last 25 years to encompass many different genres, all contributing to his unique jazz style. After playing with Willie Ruff and the Yale Jazz Ensemble, as well as the Yale Symphonic Band, C M was an active musician in NYC during the 80's, playing trumpet in a Brooklyn calypso band, writing and recording many songs, and leading his own band. After a hiatus from music, he resumed composing and recording again in mid-2000." So far the short bio, which is published at http://www.javamusic.com/cm. "One of my main objectives musically in 2002 was to collaborate with many different musicians through the internet. Many of the recordings on "Lucidity" have been improved by the involvement of some very talented musicians from Italy, England, Canada and various parts of the US. Several of these artists are fellow members of the Free Audio Player collective (www.freeaudioplayer.com)." C M's idea behind his new album is fascinating: "As a student in college, I spent time studying the stream of consciousness and its relationship to musical creativity. So I find fascinating the concept of "lucid dreaming", the state of dreaming while knowing that you are dreaming. I can think of no better metaphor for my experience of musical improvisation than this. As the music flows by, I can become lost in the dream-like state of wonder and uncertainty, never quite sure where the music is taking me. Yet, in the midst of this dream, through my horn I find a sense of clarity and direction. On another level, I experience a temporary sense of lucidity through the clarity and meaning of a piece of music, in the midst of the chaos and unpredictability of daily life." Savvy, the first track, is the best of this album. Very dynamic and groovy, it sounds like one of Rick Braun's or Herb Alpert pieces. The similiarity of style isn't accidental, both artists are obviously C M's models, although he counts Miles, Freddie Hubbard or Herbie Hancock to his influences. Savvy was written and produced by Bob Gaynor, who is also an acclaimed artist of the mp3.com-scene.This was the first time Bob has done an internet-based collaboration. several people to Bob Johnson, who lives in Canada and has lots of internet collaboration experience through his membership in the virtual band "The FunkDawgs". Bob was eager to add a part to the song, and C M looks forward to doing more projects with Bob in the future. Beside trumpet and flugelhorn C M is also a perfect player of keyboards, percussion and drum programming. Thirst is C M' version of a wonderful song written by Italy's Lord Bygon, which he has performed many times and has recorded several different versions. C M plays a warm and clear flugelhorn in an atmospheric mood. C M comments: "This was my first experience recording a "cover" version of a song written by a fellow independent artist. I think Lord Bygon is an excellent songwriter, and I plan on recording more of his compositions in the future. Although my version of "Thirst" is instrumental, the lyrics are quite good also." Chasing After Wind is different to the previous pieces in style, arrangement and interpretation. A song, written and performed by Jeza, an U.K. artist. C M contributed flugelhorn, percussion and keyboard parts to his version of the song. He agreed to allow C M to produce his own mix of the song, for which he recorded new horn and percussion parts. The lyrics of this song are by King Solomon from The Book of Ecclesiastes. 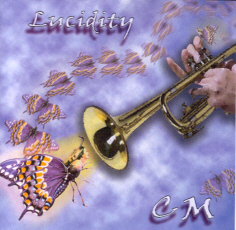 The title track Lucidity is a quiet, introspective solo piece, on which C M plays muted trumpet and keyboards. A piece for contemplation and reminescences. Close To My Soul features an acoustic guitar solo by NY jazz artist Bill Farrish. This slow piece prolongues the mood of a silent hour. one of the real highlights of the entire album. I can agree without reservation. Steve also produced and mixed this song, and he also mixed "Keisha's Lament". Yellow Jacket Swim is a departure from C M's normal musical territory, this composition was an attempt to produce some "acid jazz", and he collaborated on it with the young local electronic musician/engineer Q a e, who did some interesting remixing with the individual musical phrases C M provided him. This experimental tune reveals that mp3.com artists have still the freedom to choose what they want to play. Swing Low, Sweet Chariot is a collaboration with singer Kim Novak, who lives in Texas, grew out of an upcoming album project for Minneapolis Coalition Records (MCR), involving modern versions of older public domain songs. They worked on giving this old and often-recorded spiritual a fresh, world sound, with many little interlocking musical parts. It's sounds like a Carribean gospel interpretation. Obviously a reminiscence to C M's previous activity in a calypso band. Chasing After Wind (Reprise) is an instrumental version of the above song #4. C M comments: "I enjoyed this composition and rhythm track so much, I wanted to stretch out and enjoy playing with it some more!" The CD-booklet doesn't mention this tune. bring my album to a close." Although C M 's album Lucidity isn't a dancefloor album for headboppers, I selected it for a review, because it has some qualities I miss on many albums today. C M's songs have a soul.